Hi everyone, hope you have all enjoyed your Bank Holiday weekend. Weather's not been too bad here hope it was the same where you lived. Card I have to show you is a commission card from the same customer as before but this time it's for her daughter's birthday. This is done on an 8 x 8 scalloped card and the image is Fancy from Saturated Canary. I coloured her in with Flexmarkers, I love these markers I think they are brilliant! I cut her out with Spellbinders Labels Twenty-Nine and matted her onto some green pearlescent card which I cut out with the same die. I used a Marianne Design Rose die for the border which was cut out of green pearlescent card. Other Marianne Design dies I used are the butterflies, the small swirls and the leaf flourish! 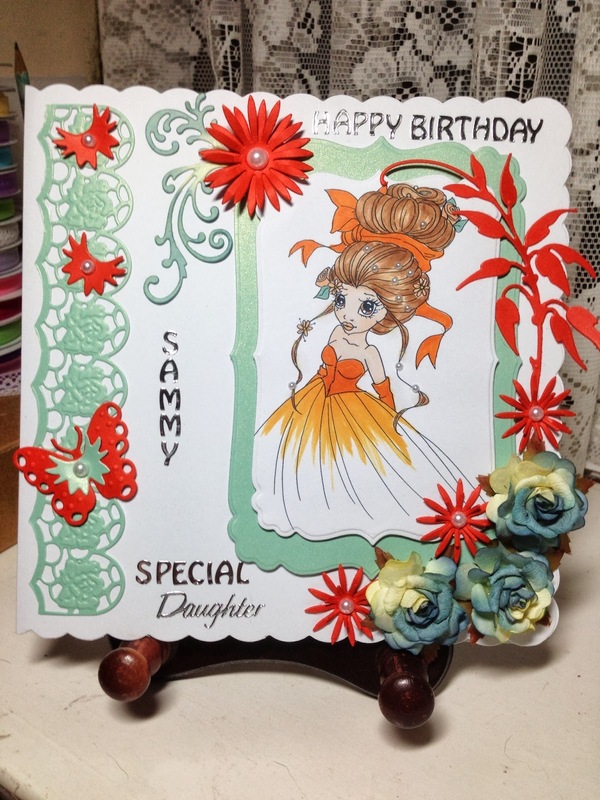 I used Spellbinders Delicate Aster for the orange flowers and the other flowers I used were out of my stash. Used some peel offs and the jobs finished. Thank you for visiting. It means a lot to have your comments on my cards it assures me that I'm going in the right direction. This is my kind of card, flowers, flourishes, great layout and a stunning image, I love that digi stamp from saturated canary. This is beautiful Pat, I love the image and the gorgeous embellishments. Lovely image, coloured so well, great flourishes , flowers and leaves - great card. The colours on this are gorgeous and the image is great. Gorgeous bright colours, wonderful diecuts and those flowers are beautiful.